If you are in a wheelchair, it’s important that you have just as many opportunities as an able-bodied person. By exploring your options, you will be able to find ways to adapt your lifestyle to give you the independence you need to live a happy, long and fulfilled life. Here are a few ways to be more independent as a wheelchair user. Wheelchair users may feel restricted by the things they can do such as moving while holding items. Thankfully, there are many services that provide wheelchair skills classes, helping to increase your independence and inspiring you to rethink what lies ahead in your future. These classes include the basics such as pushing forward and backward, as well as addressing more complex moves such as pushing with one hand and going up and down ramps. Learning new skills can be incredibly beneficial and help you feel more confident. Finding activities that you enjoy can be a great way to get outside the house as well as enabling you to be more independent. What’s more, it can keep you emotionally and physically engaged with others, which can improve your health and fitness. There are plenty of group activities that you can partake in, such as book clubs or sports clubs. You may benefit from engaging with other wheelchair users where you can go for a stroll around your local area. Speaking to those in the same boat as you will help you feel that you’re not alone. If you feel like you are restricted in a wheelchair, you may not realize that you can do as much as someone who is not in a wheelchair. From cooking meals to partaking in races, the possibilities are endless. Maintaining a positive outlook on life and setting objectives and goals for yourself can help to boost your confidence and give you something to look forward to. Take time to explore the sorts of things you enjoy. There are plenty of exciting sports and attractions that you can do as a wheelchair user, such as skydiving, kayaking, and skiing. If you have suddenly found yourself in a wheelchair, it’s important to take time to adjust to your new life. It’s perfectly natural to feel fear and anxiety when you think about the future, so acknowledging your worries and concerns can help you overcome them and learn to embrace what lies ahead. There are new technologies being made, which are helping wheelchair users to push the boundaries. In some instances, you may need a helping hand. Don’t be afraid to ask for help if you are struggling with something. It does not mean that you are any less dependent, but you should be aware of your boundaries. Knowing your limitations means that others can know when you require a little bit of assistance. If you can perform a task and someone has offered to help, simply decline their offer politely but thank them anyway. Having family and friends around you can provide that extra layer of support should you need it. If you ever need assistance, knowing there’s someone at the other end of the phone can make a huge difference. One of the simplest ways to be more independent is by eliminating obstacles in your home, which may make it difficult for to maneuver around in. Making your home more handicap accessible can change your life for the better. Whether it involves installing rails and ramps or storing items at a height that you can reach, this will mean you can live on your own without any fears of causing injury to yourself. You should check what flooring you have in your home, as well as where your furniture is placed, so you can move around with ease. There are various options that you can pick when it comes to driving as a wheelchair user. Being able to get out of the house and drive wherever you wish can massively improve your independence and mean you are not stuck inside all day. You should consult a specialist who can provide more information on wheelchair-accessible vehicles to help you select the right one for you. There may be various modifications that you need to make to ensure you can drive around without any issues. Also, ask your car dealer about financing options too. Just because you are in a wheelchair it does not mean you have to limit yourself when it comes to travel. If there is a place you’ve always dreamed of visiting, simply visit a travel agent who specializes in disabled travel so you can turn your dreams into a reality. You may want to book a vacation package that is specifically tailored for people in wheelchairs. Just like with any vacation, it’s best to book your travel as far in advance as possible. Not only will this ensure that you have the correct amenities, but it also minimizes the risk of uncomfortable situations throughout your trip. If you are traveling by plane, there are various tips that you should know about to help your journey go as smoothly as possible. Working out each day can help improve your stamina and muscle tone. The more exercise you do, the more improvements you will make, which can help you be more independent. There are a variety of exercise programs that can be adapted for wheelchair users. Try and aim for some form of physical exercise 5-6 days each week. Making minor changes to your lifestyle can make a huge difference and help you feel more independent as a wheelchair user. 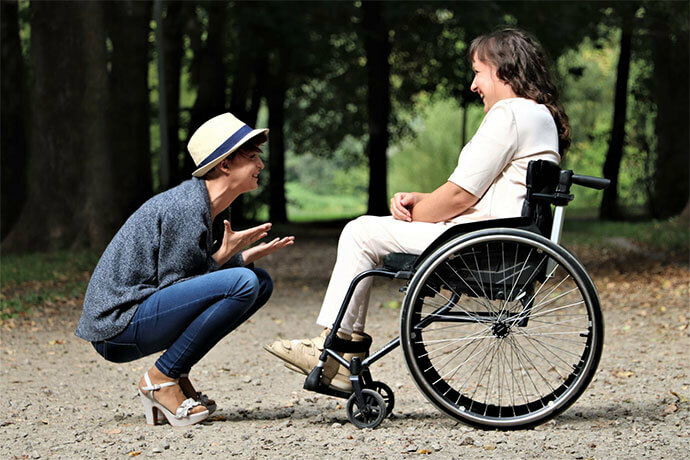 If you have been in an accident and suddenly found yourself in a wheelchair, adjusting to your new life can be hard, so if you ever need help, it’s important to have your family and friends around you as a support network. Previous PostDiscussing Funeral Plans with Your Loved Ones Next PostThe In-Store Credit Card: A Credit Trap or Financial Blessing? Marie Nieves is a student and a blogger who loves unusual trips, gadgets and creative ideas. On her travels she likes to read poetry and prose and to surf the Internet. Her favourite writer is Tracy Chevalier and she always carries one of her books in her bag. Marie loves to share her experiences and talk about practical solutions. She is an avid lover of photography interested in interior and exterior design and regular author on Smooth Decorator.